The strength and durability you find in our bullet traps is also found in our targets. Selecting the proper steel wasn't an after thought, but our only thought. While surface-hardened steel is chemically treated for hardness only on the surface, our steel is rated to perform without cratering under extreme conditions. We're not alone in vouching for these ratings - they're also certified by the U.S. steel industry. Selecting the stronger steel was one of the most important decisions we made, and considering the performance, one of the best. Reversible plates: All impact plates deform when shot repeatedly. This isn't a problem for our targets since we've made the plates reversible. 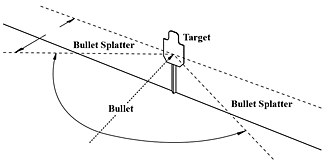 Depending on the target model, you either remove the pin, flip the plate and reinsert the pin, or simply lift out the plate and flip it around. Turning them before they start deforming keeps the splatter pattern safe and predictable, so when you shoot, targets don't shoot back. Most of our portable targets fit together without using tools and assemble by in a few minutes. Paper targets and wooden firring strips not included. The plate is set at a specific angle for close-quarter use. Withstands most calibers including .223, .308 NATO, 30-06 300 win. mag. and shotgun slugs. Emits a loud clang when hit. Available with optional Hostage head plate and upright guard. DIMENSIONS: 18" x 48" x 56"
Savage Range Systems Reactive Targets are all constructed with the same 3/8" through-hardened steel for maximum strength. Reactive targets are available with manual reset, while some models have the option of pneumatic resetting. Custom fabrication is also available for any target requirement - all built with the same strength and durability found in all Savage Range Systems products! 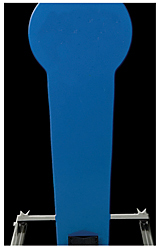 Impact plates are painted blue for easy recognition and are rated to perform without cratering under extreme conditions! Plates emit a loud clang when hit. Adjustable bolts: We know people often do their training with different weapons, so we made it easy to change calibers without switching targets. A bolt located in front of each impact plate customizes any reactive target for varying power factors. Deflection plates: The best design won't last long if it's left vulnerable to direct fire, so every hinge and reset mechanism on every target is protected by a 3/8" steel plate - the proper thickness to withstand direct hits without sustaining deformation or damage. The rail can be made any length (our personal record is 350'). Two target carriers travel along a 4" aluminum H-beam on 4" solid steel V-groove wheels. Grease fittings make periodic lubrication a no-brainer. On one end of the rail, four greaseable pillow-block bearing assemblies reduce friction, and we placed shock absorbers on both ends to cushion any over-run. The target system bolts to a concrete slab at least 1' wide running the length of the rail. We handle all the installation and provide directions for correctly erecting a ballistic barrier, such as a wall of railroad ties, leaving only the targets exposed. DIMENSIONS: Go for it, and help set a new record. MOTOR DRIVE: 90 Volt DC motor, 1/2 hp. Plug the controller cable into a generator or standard wall socket. The controller converts 110 volt AC into 90 volt DC, preventing high voltage from traveling downrange. While most electrical targets offer 80' our carrier gives you a minimum of 100'. Two 4" x 4" wooden uprights form the stand and fit snugly into steel H-bases. 2-12" and 2-22" steel stakes hold the bases firmly in place while the two tie-down straps ratchet down snare drum-tight after being staked into the ground. The target carriers travel on wheels that have permanently-lubricated bearings. 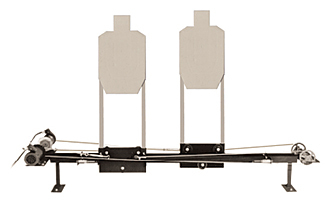 The overhead support cable accepts up to three paper targets. And though it's one of the largest targets we offer, all the parts fit easily into most any trunk. WEIGHT: 167 lbs. Heaviest piece 50 lbs. MOTOR DRIVES: 90 Volt DC motor, 1/2 hp. Plug the controller cable into a generator or standard wall socket. Or attach the power inverter to a 12 volt DC battery. 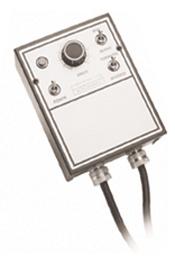 The controller converts 110 volt AC into 90 volt DC, preventing high voltage from traveling downrange. Savage Range Systems offers Pneumatic Turning Targets. All pneumatic targets utilize our "Pivot Mechanism" - instead of a single one-point bushing (with the nasty habit of breaking before ever wearing out), ours is supported on both ends of the shaft by greasable, pillow-block bearing assemblies. Not sure how you want to configure the paper or board target? No problem! That's why we've designed the "Multi-function Target." One target that can be positioned four ways - Swing-out, Sideways Pop-up, 90° Turner and pop-up - to give you the most options. In less than a minute you can change your target to suit your training needs. Another example why Savage Range Systems is a leader in target design. Have their electronics enclosed in a weatherproof box. Use nylon air lines which last 30 times longer than polypropylene when exposed to UV rays. Are suitable for both indoor and outdoor training. Can be floor/ground mounted or overhead mounted. Use a 110 volt power source. Can be built from stainless steel for corrosive environments. The Nexgen Target Control System is what the name implies... the next generation of target control! With a System Control Platform based on an Allen-Bradley/Rockwell Automations Compact Logix controller, mounted in a NEMA rated steel enclosure for maximum protection, Savage's Nexgen Target Control System brings outstanding performance and operation to pneumatic and Running Man systems like never before. Imagine programming multiple "course of fire" exercises, with up to 15 steps in each, and storing them for future use. The Nexgen system operates from a console that can be wall, desk or pedestal mounted, or can be programmed onto a dedicated laptop. System operations can be actuated with an optional tablet based wireless remote. Unlike some remote control systems the NEXGEN remote provides full functionality. Yet, as advanced as the Nexgen system is, it allows for ease of maintenance, as all parts are off-the-shelf, so you don't need to return the system to Savage for repair or replacement parts since they are available to you locally! Remarkable programming capability, multiple course of fire functionality, ease of use, remote capability and off-the-shelf maintenance truly make this the most advance target control system available... and of course, it's from Savage! Warning: There are many critical considerations in using steel targets safely. You must assume responsibility for reading and following the guidelines provided in our Safety And Use Guide, available as a down-loadable PDF in the Brochures and Literature section of our site. Failure to follow these guidelines can result in serious injury or death.